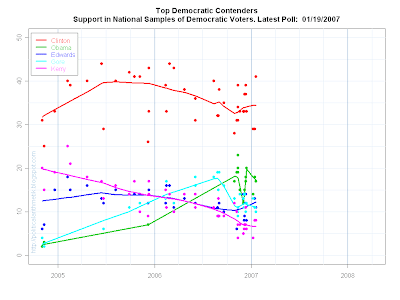 This post tracks the national Republican vs. Democrat trial heats for the 2008 presidential election. It is updated in place so a link to this page will always come to the most recently updated trial heat data. Warning note: Recent polling has given most attention to pairings of Giuliani or Thompson against Clinton or Obama. Romney and especially McCain have been less likely to be included in a test. Likewise Edwards has often been omitted from trail heat questions. This means that the current estimate for McCain vs. Edwards, for example, is heavily influenced by the single recent poll that tested that pairing. When using these charts, look to see that the latest estimates are based on several recent polls. If not, then the results will primarily reflect just the single most recent result. That does not mean the trend estimate is wrong, just that it is based on less data than we usually would like to have. There is a link to this page from the Trial Heat thumbnail in the right-hand column. The trend line is only estimated and plotted when there are at least 8 data points to fit. If there are fewer, then only the points are plotted. The estimated candidate support in the figure heading is the latest trend estimate if there are 8 or more polls. Otherwise it is the median of the polls that are available. The "latest poll" can vary across pairs of candidates because not all polls ask about all pairs. Polling has avoided trial heats among the least known candidates so far. More will be added as data become available. I'll avoid commentary here, where the point is just the display of the data. For commentary and other posts on the 2008 Presidential race, click on the "Pres08" label below or on the link in the right column of the page under "2008 Trial Heats". 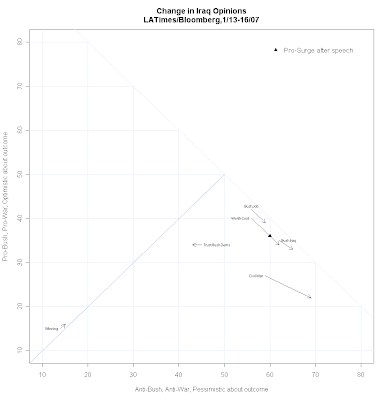 The estimated trend is printed as part of the graphs. For the top candidates, this is always the local regression trend estimate. 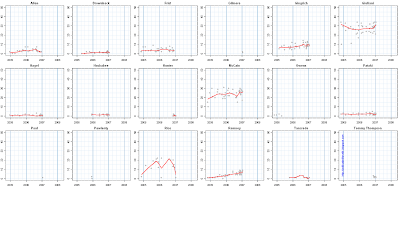 In the individual candidate graphs below if there are 10 or more polls the trend estimate is printed. If less than 10, the median of the polls is printed and no trend line is drawn. For all posts on the 2008 presidential contest, click on or search for the "Pres08" label at the bottom of the post. The link in the right column of the front page will bring you here throughout the primaries and will announce new poll updates. Hillary Clinton and Rudy Giuliani are doing better in national polling than in the critical early primary and caucus states. Clinton leads all national Democratic polls, while Giuliani leads McCain in 33 of 43 national polls. But neither candidate does as well when we turn to the polling from the early voting states. 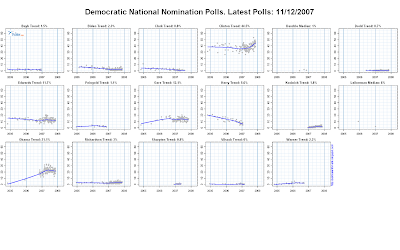 Conversely, John Edwards does considerably better in all but two state polls than he does nationally. Clinton's national support is significantly higher than it is in Iowa and New Hampshire. Nevada and South Carolina (with only 3 polls together) are just about equal to her national standing. Giuliani has seen some convergence in state and national polls, though his current national support is still above support in three of the states, IA, NH and SC. The sharpest contrast is with Edwards who does considerably better in IA, NH and SC than he does nationally. Nevada is again the state closest to his national standing. McCain, Obama and Gingrich show the states spread around their national numbers. McCain in particular has seen some apparent decline in NH over the past 12 months, bringing initially favorable NH number down to his national levels. South Carolina with only 4 polls appears to have slipped a bit as well, but remains well above the national. In Iowa, McCain does no better but also not much worse than he does nationally. The trend in NH must, of course, be of concern for his campaign. Likewise, McCain's national support has been essentially flat over the past year. In Obama's case, there are relatively few polls so trends are not yet clear. There is not a wide gap between state and nation, though the national is a bit above most of the state polls. Gingrich is still well behind Giuliani and McCain and his state polling if pretty evenly distributed above and below the national trend. Given the limited nature of his campaign so far there have been few events to affect these trends. As we all know, the early primary states are not a representative sample of the country, so divergence of state from national polls is to be expected. But the political consequences of doing well nationally but less well in these four states can be profound. We'll keep an eye on these trends. A flood of new polls have come out since late last week. Eight national samples have been reported with field dates since January 16. The results: 35% (Fox), 36% (AP), 31% (Newsweek), 33% (ABC/WP), 35% (NBC/WSJ), 28% (CBS/NYT), 34% (CNN) and 34% (ARG). In addition, a Pew Research Center poll conducted 1/10-15/07 found approval at 33%. 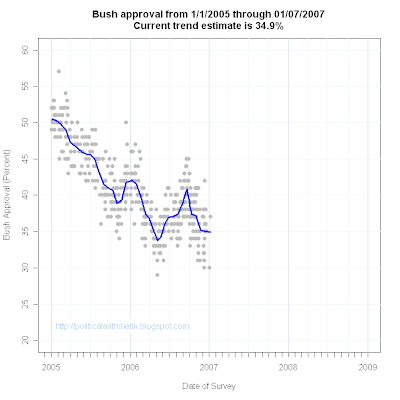 Those polls together produce a trend estimate of 34.0%, two one-hundredths of a point above the low point of the trend estimator for the Bush presidency. The CBS poll is far enough away from the trend to qualify as an outlier, but the trend estimate is not particularly sensitive to that low value, thanks to the abundance of polling. The simple mean of the last eight polls is 33.25% with the CBS value included, and 34.0% without it. The median is 34% either with or without CBS. That CBS reading is a point lower than the previous all time low for any polls of the Bush administration. The CBS poll will get the most attention but the trend at 34.0% is both more defensible as the estimate of current approval and carries with it a sufficiently damaging assessment of the President. A lame duck this close to his all time low approval rating estimate is unable to do much to alter his circumstances. Faced with a hostile Congress with a growing resistance (not yet rebellion) among his own party's Senators, the State of the Union address is unlikely to create new opportunities for the President. The very consistent polling showing support for the troop increase in Iraq in the 30%-35% range means that the one striking new proposal for Iraq the President has made has failed to win support with the public. For better or worse, presidential approval may have moved out of the realm of rhetoric and into the hands of events. I doubt any presidential speech can affect public approval. The fate of the President's support now rests in the hands of Iraqis and members of Congress. The State of the Union address has come to be a major moment in the political year. Despite the increased prominence of the speech, the effect of State of the Union addresses on presidential approval has generally been small to non-existent. 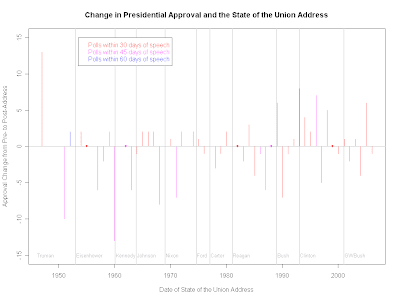 The average change from before to after the SotU since 1946 has been -0.3 percentage points. Of the 50 post-war speeches for which we have good data, 30 changed approval of the president by 2 percentage points or less. So it is unlikely that President Bush's address Tuesday night will do much to alter public perceptions in either direction, despite the hype around the speech. The figure above plots change in approval in Gallup poll readings of presidential approval from before to after the SotU. Ideally we'd have polls taken just before and again just after the address. 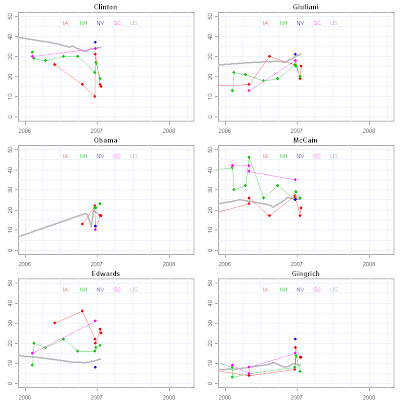 In recent years that has been fairly common, but in earlier years polling was far less frequent. I've measured the days between the speech and the pre-poll and the post-poll. The figure plots the effects for polls taken within 30 days of the address, within 45 days and within 60 days. Where no poll was available within 60 days I've excluded the speech. Even so, some of these polls are far enough apart that attributing effects to the speech per se is suspect. But given the low levels of change, it seems safe to bet that the overall impression of low effects of the speech would not change with a tighter window of polls around the speech. President Clinton is the one post-war president who enjoyed the greatest success with the SotU. Five of his eight addresses were accompanied by at least a bit of a positive bounce, though even in his case most of these are short of statistical significance. did not benefit from his addresses. Only two of his eight addresses showed any positive bounce. President Bush has likewise not benefited from most of his addresses. Only in 2005 did he get a positive upturn in approval. His other addresses have produced little change in either direction. So we should dial down any expectations that the State of the Union address is a moment to "salvage a presidency" or "set a new course" or "right the ship of state". The record is clear that those expectations are loftier than the speech has been able to attain. Hillary Clinton has served in the Senate for only six years but she has one of the longest polling records in American politics, going back over 13 years to the beginning of her time as First Lady in 1993. 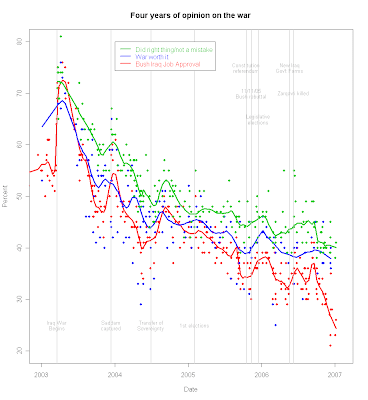 No other Presidential contender has this long a track record of public opinion readings. As a result we have an unparalleled record of the ups and downs of public response to Sen. Clinton. There was considerably more variation in favorable/unfavorable ratings during her time in the West Wing than there has been since Sen. Clinton became an elected official in 2001. The White House years describe the downturn in favorability during first two years, which included the failure of her leadership of the health reform initiative. Sen. Clinton's favorability rebounded during and following the 1996 presidential election. The effect of the Lewinsky scandal was largely favorable to Senator Clinton, if not to President Clinton. The decision to run for the U.S. Senate in 2000 produced a new downturn in favorable opinion (and upturn in unfavorable views). However, since she took office in 2001, Senator Clinton has enjoyed relatively stable favorable ratings of around 50%, while unfavorable ratings have averaged in the mid-40s. This sharp split is, of course, one of the more widely remarked aspects of Sen. Clinton's public image. Most recently, there has been a modest upturn in favorable ratings, especially since the fall elections. The figure above plots and estimates the trend in favorable/unfavorable ratings after removing the poll to poll variation, also known as "house effects". These are effects due to the standard practices of different polling organizations that introduce systematic differences in results. For example, some polls make it easier for respondents to say they "don't know" their feelings towards a political figure, while others produce lower rates of "don't know" response, pushing more survey respondents to pick a positive or negative response. In the plot above, I've used an iterative estimation procedure to remove the "house effects" and norm the results to those of the Gallup organization. This provides better comparability because it adjusts all polls to a common standard. However, it changes the observed poll results to fit the model. Some may wish to see the raw data. They are presented below. The figure below plots the raw, unadjusted, data. The greater spread in the gray data points is due to the house effects. 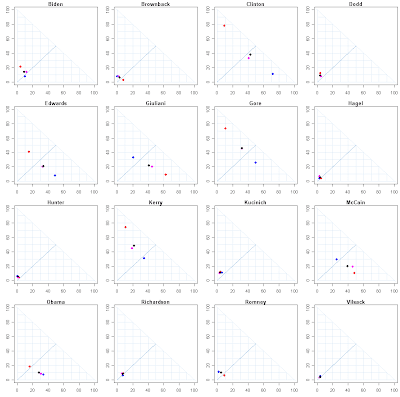 In particular, you can see the "don't know" response has considerably greater variation in the unadjusted data. 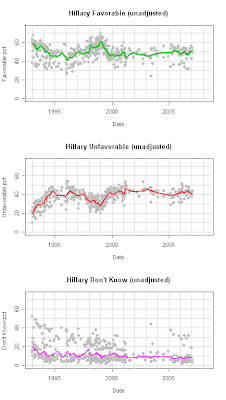 The broad outlines of Senator Clinton's favorable and unfavorable ratings are similar to the adjusted ones. The late upturn in approval, however, is largely only visible when house effects have been removed. The raw data suggest less recent movement. The bottom line of these data is that Senator Clinton remains a public figure who has both a large following of supporters and one who suffers from a substantial antipathy. At the moment, the Senator enjoys more supporters than opponents. Whether than margin is enough to win a national contest or now is, of course, what Democrats (and perhaps the rest of the electorate) will have to decide in the coming months. 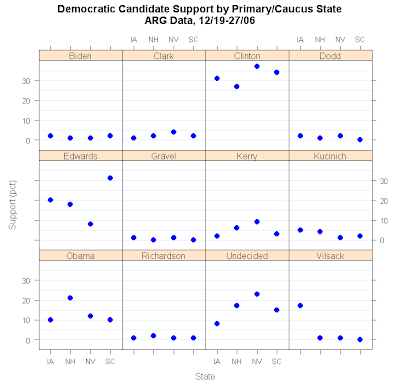 The rest of the Democratic field can be found in the graph above. I've stopped including every single person asked about in a survey. (Zogby included journalist Bill Moyers in its latest, for example.) I'm including candidates and former candidates who are at least frequently mentioned as potential candidates of some seriousness. Of course if a candidate becomes more prominent (former Alaska Sen. Mike Gravel, for example) I'll add them to the plot. I keep some who have dropped out because the comparison of where they were when they quit is instructive. None of those in low single digits has yet made a move, unless you count Obama from 2004. Likewise here with the Republicans I've trimmed the field a bit. (Some pollster thought it made sense to include California Gov. Schwarzenegger, for example, who can't be elected without a constitutional amendment.) Without an Obama-like rise, none of the dark-horses here have yet made a significant move in the polling. By the way, it isn't home state rooting for former Wisconsin Gov. Tommy Thompson that gives him a first name here-- some polls have included former Tennessee Sen. Fred Thompson in their candidate list, and both are sufficiently short of being household names I thought I should distinguish them. If Fred Thompson stays out of the race, I'll strip my former Governor of his first name. 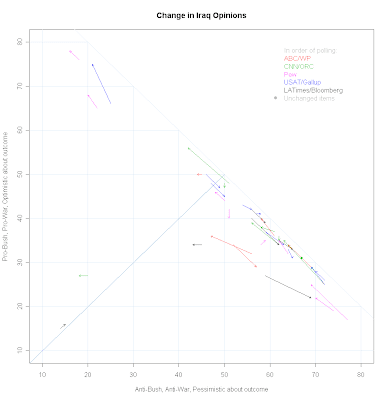 Shifts in opinion on Iraq immediately following President Bush's speech last week were not as uniformly negative as some reporting implied. However, the response turned more negative as time passed following the speech. The immediate aftermath of the speech found generally small shifts, yet more of these moved towards the administration's positions than against them. In contrast, by the weekend and later polls found most opinion moving against the administration. This difference reflects the role of congressional reaction and media coverage of that reaction in shaping response over time, in contrast to the immediate response to the speech itself. There are now five polls conducted entirely after President Bush's speech on Iraq last week. (CBS News did a "call back" with previously interviewed respondents the night of the speech. I'm leaving that out because it isn't a fresh sample and not all original respondents could be reached that night.) ABC/Washington Post did a post-speech survey on January 10. CNN/Opinion Research Corporation (CNN/ORC) conducted a poll on 1/11. The Pew Research Center conducted interviews 1/10-15. USAToday/Gallup polled 1/12-14. LATimes/Bloomberg interviewed 1/13-16. While partially overlapping, these polls are ordered in time and let us look at how reaction to the speech has developed over time. The Pew survey had the longest field period and completely overlaps the USAToday/Gallup poll. Pew has two days of interviews before Gallup began and one day after Gallup. I'm assuming this means the average Pew respondent was interviewed earlier than the average Gallup respondent. Polls often (but not always) complete most of their interviews early in the interviewing period, which would push the average Pew date earlier as well, but I don't know if that was true of this specific Pew poll. If this assumption is false, then my story below is not quite so neat so bear this caveat in mind. There are a large number of questions that have been asked about Iraq in these polls. Each reflects support or opposition to some aspect of the administration's policies, approval or disapproval of the President's handling of Iraq, and optimism or pessimism about the prospects for success in Iraq. Usually we focus on a single question such as support or opposition for the troop increase. But we can also get a sense of how the wider range of opinion is shifting by looking at a number of questions simultaneously. Here I take the latter approach. The data I use are all questions in any of the five surveys for which there is a "before" and "after" reading of opinion. Most of the "before" readings are from January or December, though a few come from earlier. The specific questions are listed at the bottom of this post. The figure above shows how opinion shifted from before to after the speech for all these items. The arrows begin at the "before" and point to the "after" poll result. In this figure I don't try to label the specific questions (I do that below.) Here the idea is to look at the overall direction of movement. Arrows that point toward the upper left corner indicate movement that favors the administration's positions, moves toward a more positive view of the president (or a negative view towards the Democrats) or expresses increased optimism (or reduced pessimism) toward the war or its likely outcome. So arrows pointing "northwest" (or due west) are good for the administration. Arrows pointing the opposite direction, southeast or due south, are the opposite: bad news for the administration. The longer the arrow, the bigger the change. Arrows pointing northeast or southwest are mixed messages with both support and opposition increasing (northeast) or decreasing (southwest). Only a few of these appear in the data. The arrows are color coded by poll and therefore by time as well. The legend gives the order of polling as well as pollster. There is a danger here of confounding the effects of time after the speech with "house effects" that reflect persistent differences between polling organizations. I've mitigated that confound here by measuring change within polling organization, from that pollster's "before" to the same pollster's "after" reading. If one organization typically produces higher approval ratings than does another pollster that difference would show up in where the arrows start but the direction and extent of change would be measured from that pollster's baseline, subtracting out the house effect. This isn't foolproof and it is conceivable that house effects also affect change measures, but this approach should mitigate house effects by relying on “apples to apples” comparisons. Most arrows begin and end in the lower right portion of the figure, reflecting the generally negative balance of opinion on the war. It is this fact that has received the most attention in reports on the post-speech polling. Minorities support the troop increase, approve of Bush's handling of the war, and are optimistic about the outcome of the war. As a result the headlines tended to stress the net negative evaluation while paying less attention to the direction of change following the speech. This leaves the impression that the speech failed to increase support for the administration. If we focus on the arrows, we see a more interesting pattern of change. Over half of the arrows (20 of 37) point to the northwest or west, indicating increased support for the administration. So the change in opinion was by no means a net negative when viewed across all items and polls. But the shifts are not random. As time goes by, the shifts of opinion become more negative toward the administration's positions. We can see this more clearly by looking at each poll in turn, avoiding the clutter of overlapping arrows above. The CNN/ORC poll taken the next day found 6 of 9 shifts pointing northwest or west. Those saying Bush has a clear plan on the war increased 10 points in the President's favor. Bush's handling of the war (+1), saying US defeat was not possible (+5), trust that the Iraq government could handle the situation (+1), and trust that the US government can handle the Iraq situation (+8) (though note that this is the US government so this could include increased optimism about a Democratic Congress rather than support for the administration.) And while belief that victory would be the outcome did not increase, those thinking defeat would be the outcome declined (-2). One item failed to change at all, support or opposition to the war overall. And two items moved slightly away from the President's positions: believing that victory is possible (-1) and Bush's overall job approval (-1). Pew found 6 of 8 items shifting in the President's direction. Saying the US needs more troops (+8), Bush has a clear plan (+3), the US effort is going well (+3), we should keep troops in Iraq until the situation stabilizes (+2), that the Democrats LACK a clear plan for Iraq (+3) and the we should NOT immediately withdraw (+2). Only on the question if whether the war was a mistake did opinion move away from the administration (-2). Those favoring a timetable for withdrawal moved ambiguously with both positions increasing slightly. So the initial polling was quite consistent in finding small movements in favor of the administration's positions. Only a few of these shifts were outside the margin of error, but the clear preponderance of movement (16 of 22 items) was towards the President's views. If you scroll back over the figures, you'll note that all of the polls agree on the low level of support for President Bush's surge proposal. The triangular point in each figure locates this amidst the changes. The support for the surge readings are 36%, 32%, 31%, 38% and 36%. These low levels of support provided the basis for headlines that stressed the negative reaction to the President's speech, but overlooked the direction of change in opinion in these initial polls. As reaction accumulated, the direction of opinion shift turned substantially to the southeast. The blue arrows from USAT/Gallup's weekend poll tell quite a different story from the initial polls. Only 3 of 9 USAT/Gallup items point northwest. Six of the nine arrows point to the southeast, opinions shifting against the administration. Gallup found movement in the President's direction for having a clear plan (+4), Bush job on Iraq (+2) and the Democrats LACKING a clear plan (+9). But for six other items opinion shifted away from the administration: those thinking we will win in Iraq (-3), can achieve our goals (-3), should not withdraw (-1), Bush's overall job (-3), and war has been worth the cost (-2). Those thinking the war was a mistake increased by 1 point though those saying it was not a mistake held steady. These changes in response direction are most likely the result of Congressional reaction, including the several Republican Senators who were quite negative towards the troop increase and the related media coverage of the issue. These reactions provided an important element of news reporting that balanced the President's speech with not only predictably negative Democratic reaction but that also stressed the negative reactions of conservative Republicans such as Chuck Hagel and Sam Brownback. The low support for the troop increase in the polls also played a roll in the developing opinion. By focusing on the low level of support for the surge, news stories about polls emphasized a negative reaction. But they might just as well have focused on items that moved in Bush's direction. These items mostly remained in net-negative territory, so that is also part of the story, but the direction of change should count for something as well in assessing reaction to the speech and the surge proposal. I do not mean to suggest here that the net opposition to the increase is not part of the story. Far from it. But if our purpose is to assess the impact of the speech, then incremental change is what is most important. Surely no one would imagine that a speech could completely reverse the current views of the war. But if the administration is to improve its standing with the public, it must do so in small, positive, changes. The evidence is that the speech succeeded in accomplishing that modest goal. Where the policy has so far failed is in also mobilizing support from members of Congress. The secondary reaction to the surge policy has overcome the initial movement towards the administration. For my part, the dynamic of opinion shift over the past week is a textbook example of how opinion change depends on both the event itself (the speech) and the subsequent reaction and interpretation. Approval of President Bush is at 34% in the latest Gallup/USAToday poll, completed 1/12-14/07. Disapproval stands at 63%. The CNN/Opinion Research Corp. poll completed 1/11/07, just after the President's speech, found 35% approval and 62% disapproval. An AP/Ipsos poll completed just BEFORE the speech placed approval at 32% and disapproval at 65%. (ABC and CBS did post-speech polls. CBS' was a call back to previously interviewed respondents, not a new sample, and ABC's new sample did not include overall approval of Bush's handling of his job.) 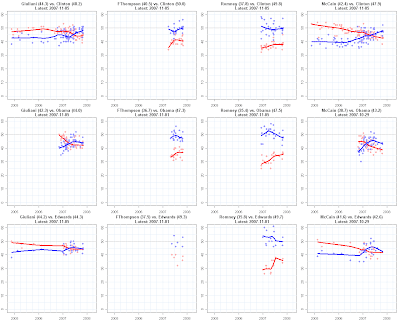 See my poll comparison plots at Pollster.com here for the trends in each poll. With these new polls, the approval trend stands at 34.0% (33.98% if you don't believe in rounding.) The trend remains vulnerable to a relatively small number of new polls in January. The trend has bounced from 33.5% to 34.9% to the current 34.0%. A couple more readings would be welcome, but saying approval is 34% +/-1% would be a pretty confident estimate. The impact of the troop surge speech has appeared modest in the four post-speech polls we've seen so far. 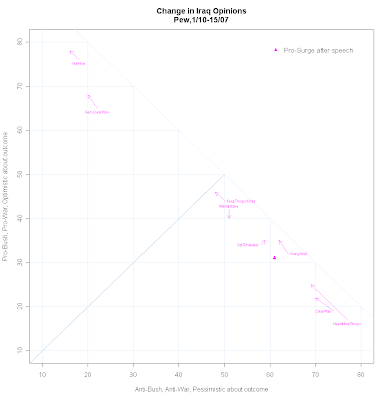 Most of these have found a point or two upturn in Iraq specific support, but flat or declines in some other measures. Certainly no large effects (either way) have been consistently found. I'll have more to say about that a bit later. With President Bush set to speak to the nation tonight on a new Iraq strategy I thought is was a good time to review the recent opinion trends related to Iraq. 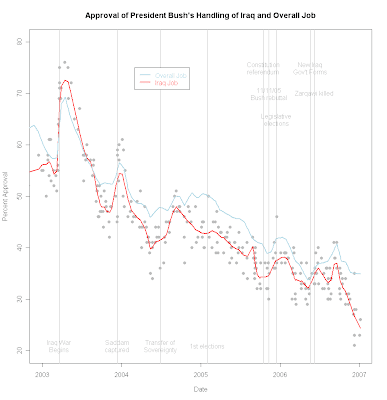 The graph above compares approval of Bush's overall job with approval of his handling of Iraq. The two have generally trended together and mostly "bounced" together. What is interesting is the change over the fall of 2006 when the Iraq job approval declined sharply while the overall job decline was less and has recently been relatively flat. 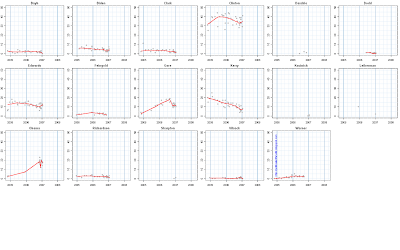 The sharp decline is based on a decent number of polls, so is not likely to be an artifact of a small number of polls. I suspect this decline is a combination of the impact of increased sectarian fighting in Iraq along with the fall campaign's critique of Republicans generally and of the President's handling of the war specifically. Whatever the cause, the sharp decline raises questions of how much credibility the White House has left to leverage support for the new strategy we will hear about tonight. While the latest CBS News poll found 61% of Republicans still supporting the President on Iraq, only 21% of Independents did and a stunning 3% of Democrats. If Republicans in Congress give good support for the President's new plan, I expect to see an increase in approval among the Republican public. I'm not nearly so confident that a substantial segment of Independents will be similarly encouraged by the new direction. Certainly there will be a mix of both positive and negative reaction to the speech, and Independents are already predisposed by their low 21% support to accept negative interpretations of the policy rather than positive ones. Unless the speech is particularly persuasive, or the supportive reaction particularly strong, I don't think it likely that Independents will move up in support by very much. With virtually no Democrats supporting the President's position on the war it is hard to see how support among that population can be expected to improve. Until recently, approval of Bush's handling of Iraq was just a few points below his overall job approval and the two moved together. Now the sharply increased gap between them suggests that the Iraq opinion is no longer strongly tied to overall views of his performance. Tonight's speech may restore that linkage, though not necessarily to the President's benefit. When approval has shrunk as low as it has for Iraq, I'm not sure you can "borrow capital" from overall approval (itself low at 34.9% based on my trend estimate) to shore up support for Iraq. Instead, I suspect that support must be found in external reaction from credible Republicans and news sources. If that happens, support may improve at least temporarily. If reaction among those sources is sharply divided it is hard to see how support for the President can be improved. The second aspect of support is to shift the argument away from the President's handling of the war and on to other aspects of opinion. Here too opinion is more negative than positive, but it is much less negative than approval of the President is. The plot below illustrates this. While more citizens now think the was was a mistake and not worth the cost than think otherwise, the gaps here are less stark than for Bush Iraq approval. Americans remain reluctant to say that the US did the "wrong" thing or made a "mistake" in starting the war. While "wrong" or "mistake" has now climbed into the 50s, making it the majority response, those rejecting this view have continued to hang in the 40s, rather than collapse into the 20s as has Bush approval on Iraq. Those thinking the war has been worth it have declined to the high 30s or low 40s. Again, not support for the war on balance, but less negativity than we see for Bush's handling. My point is not that there is strong support for the war. That clearly is false. But there are almost twice as many people who think the war was justified and worthwhile than there are those who think the administration has done a good job handling the war. If these constituencies can be persuaded that the new policies offer a hope of success in a war that was both justified and worth the cost, support might indeed increase at least to the ceiling of 40-45% that these groups represent. That would certainly be an improvement from the White House's perspective. The Gallup poll taken 1/5-7/07 also suggests the opinion niches which may be persuadable on Iraq policy. Despite all the negativity cited above, a surprising 50% think the U.S. is either "certain" (16%) or "likely" (34%) to win the war in Iraq. Forty-six percent think not: 28% say unlikely and 18% say certain not to win. Given the situation in Iraq, this represents a surprising confidence that the outcome remains "winnable." And it offers the President his best chance of gaining support for his policy by playing to these remaining hopes. On the specific issue of increasing the number of troops ("surge" or "escalation", as you prefer), 54% are clearly on the other side from the President, with 15% saying withdraw immediately and 39% saying withdraw by a year from now. But that leaves 43% on the President's side: 31% say take as long as is needed and 12% saying send more troops. So again the opportunity continued to exist to convince a substantial number of potential supporters to approve of the new plan. Asked by Gallup if the U.S. can achieve its goals in Iraq "only with more troops", "without more troops" or "cannot achieve its goals regardless of troops", only 47% say the US cannot achieve its goals. Forty-eight percent think we can achieve our goals (23% with more troops, 25% without more.) Again, about an even split in the view that the US can ultimately succeed in Iraq, and the President's mission to convince the 25% that think troops aren't needed to nevertheless think it is a good idea to add troops. Finally, the increase troops option on its own has only 36% support and 61% opposition. But that is where the speech tonight bears the burden of convincing some of these (only some, not all!) that the increase will bring improvement in the situation. Put together, if the President can muster support from something on the order of 45% of the public in favor of his plan, he will improve his standing (though not necessarily lead him to majority support.) From the White House's perspective, an improvement of this order of magnitude would be a significant move in the right direction. I've focused here on the potential for increased support because I've seen little talk of this in most polling analysis. By focusing too exclusively on Bush's Iraq job approval, which is shockingly low, we tend to overlook other areas where the public is not as negative or pessimistic. Among Democrats, these numbers would be far, far less positive. That provides the party (and especially party leaders and presidential hopefuls) a strong incentive to continue a critique of the war and of Bush policy. But the overall balance of opinion is not so overwhelmingly negative as the one indicator of Bush approval suggests. While the public judges administration performance to be terrible, there remain significant reservoirs of support for the goals and even optimism over probable outcomes. Whether those are justified or not, both parties face an electorate that is not yet solidly against the war nor solidly in favor. There is still persuasion to be done by both sides. A new Gallup/USA Today poll taken 1/5-7/07 finds approval of President Bush at 37% with disapproval at 59%. With this addition, my trend estimate stands at 34.9%. The only other January poll so far is the CBS News reading of 30% approval. As I warned in a post on the CBS poll here, the gap in polling since the third week of December means that the current trend estimate is especially sensitive to the first few polls of the new year, so the trend estimate is likely to move around a bit until we have several 2007 readings. This means the current trend is more uncertain than usual. With the President's Iraq speech expected Wednesday night, we will have a little trouble distinguishing the effects of the speech from other sources of change. It would be nice to have another couple of pre-speech polls to stabilize the estimate before assessing the impact the speech may have. The Gallup poll also has bad news for the administration on Iraq. Only 26% approve of the President's handling of Iraq while 72% disapprove. And among partisans, Republican support on Iraq is at 61% compared to 79% approval for Bush's overall job performance. Iraq approval among Republicans is also down from 73% in August. Democratic approval is an amazingly low 3%, while it is at 21% among Independents. That sets an interesting background for Wednesday's speech. How the public responds is likely to be strongly structured by partisanship, with Democratic leaders already signaling skepticism over a "surge" in troops. Since Democratic identifiers can hardly drop lower in support, the key will be whether the speech boosts support among Republicans back to last summer's levels, and especially how independents react. The latter will give us a sense of how well the President's and the Democrats' messages are working. John McCain and Rudy Giuliani lead the Republican field by a wide margin in terms of the balance of "favorable" and "unfavorable" impressions the public holds of them. On the Democratic side, Hilary Clinton and John Edwards lead the field, while Barack Obama has a net favorable image but with many voters still unable to express a reaction to him. Other candidates either remain near complete unknowns or suffer from net negative evaluations from voters in the cases of Al Gore and John Kerry. The new CBS News poll taken 1/1-3/07 gives the latest comprehensive look at 2008 presidential contestants. The survey included the standard favorable/unfavorable question, which includes "undecided" and "haven't heard of" options as well. The data here are for all adults, not just partisans of the candidate's party. The graph above plots favorable impressions on the horizontal and unfavorable views on the vertical axis. The sum of favorable and unfavorable cannot exceed 100%, so the data must fall in the triangle with the grid lines. The darker diagonal line from (0,0) to (50,50) marks the region of more net negative evaluations (above this line and and to the left) versus the region of net positive evaluations (below and to the right.) While some enemies are inevitable, candidates would rather be closer to the bottom right corner of the figure, with high net positive ratings. 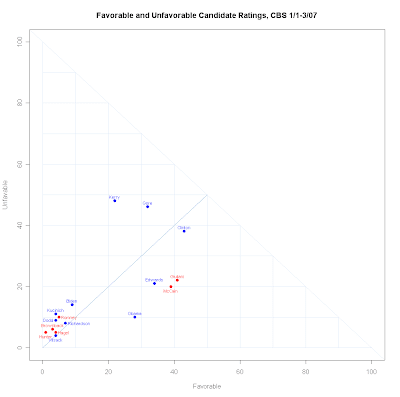 The closer a candidate is to the lower left corner the more voters failed to give a favorable OR an unfavorable evaluation. For the lesser known candidates, this is dramatic as they all cluster very near the bottom left corner. A number of people have quite correctly pointed out that current polling on presidential candidates is largely a function of name recognition and national visibility, as the performances of well known candidates Clinton, Giuliani and McCain demonstrate. The polls may also not be very meaningful predictors of future success. A classic example is from April 1991, when Bill Clinton scored 8% favorable, 12% unfavorable and 80% unable to give any impression of him. That places him solidly in the company of Romney, Richardson, Brownback and Hagel. Of course that didn't stop him from gaining the nomination. So we should certainly not look at these data as predictions of who is "destined" to win or lose. That is not my purpose here. We have a year to watch the evolution of support for these candidates. And to do that, of course, we have to look at how they stand throughout this year. Which front runners will stumble and when? Which unknowns will build a following to emerge from national obscurity to serious contention? These data are crucial for understanding that process, and that is my purpose here, rather than a simple minded (and empirically weak) implication that those currently ahead are "inevitable." It is hard for reporting or analysis to avoid emphasizing the current strengths of candidates, but experience shows that this can change substantially over time. Recall the "inevitable" triumph of Howard Dean as seen in November 2003 when discussion actually surfaced of his vice-presidential choice! We would all, me included, be well advised to treat these data as dynamic and not as fixed for the next 12-15 months. But dynamic data is fun! So let's start watching it. The cluster of Giuliani, McCain and Edwards represents a group with about a 2-1 favorable-unfavorable ratio, suggesting pretty broad appeal. But even among this group around 40% of voters are unable to express an evaluation. In contrast, Hilary Clinton holds slightly higher favorable ratings but also nearly twice as high unfavorable ratings, putting her only slightly to the "good" side of the favorable-unfavorable divide. Her higher evaluation rate of 80% is no surprise but with only 20% of voters yet to decide about her there is less room for new support or opposition to develop, while the Giuliani, McCain and Edwards grouping can move rather substantially from voters making up their minds. Senator Barack Obama trails these four substantially in the number of voters able to evaluate him, though he has the advantage of a 3-1 favorability ratio among those who do rate him. Over 70% of the sample were unable to rate him, which shows how far the Senator has to go in establishing himself with the public, despite the dramatic media coverage of him in the last quarter of 2006. The two defeated past Democratic nominees fare less well. Al Gore and John Kerry both suffer from more unfavorable than favorable ratings. In Gore's case, this comes despite positive public comment on his movie "An inconvenient truth" which was thought by some to be his route back to elective office. Among the less well known candidates there is little meaningful variation at this point. Almost all draw slightly more unfavorable than favorable evaluations, but with something on the order of 80% unable to rate these choices there is little to suggest the favorable-unfavorable ratio means much. Also, the CBS poll question does not supply either party or current office, so voters are left with little to base spur of the moment opinions on. A question about "Democrat Tom Vilsack, former Governor of Iowa" or "Republican Senator Sam Brownback of Kansas" might trigger more impressions than the simple "Tom Vilsack" and "Sam Brownback" used in the survey. The question CBS used probably does a better job of avoiding partisan projection and therefore is a better measure of awareness than one that described the candidates. On the other hand, many voters are so peripherally aware of these candidates that a little help remembering who is who can trigger real as well as top of the head opinions. One seeming peculiarity is the rate of non-response to even the well known candidates. Clinton has been in the national spotlight for 14 years and Kerry and Gore have both been nominees of their party, yet 19% failed to express an opinion of Clinton as did 22% for Gore and 30% for Kerry. Are voters REALLY so removed from politics that more than one in five really don't recognize these candidates? Well, not quite. The survey gave voters an "undecided" option as well as a "haven't heard enough about the candidate to have an opinion" option. Those two are folded together in my figure above and in most analysts review of these sort of survey questions, but it turns out the distinction is pretty interesting. 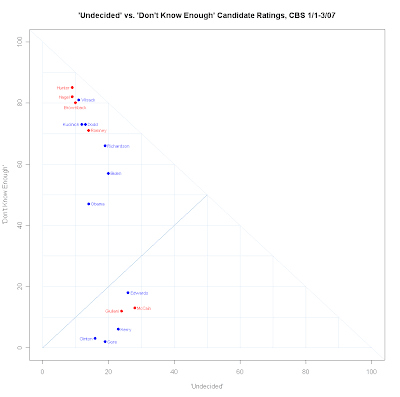 The figure below compares the rate of "undecided" with the rate of "don't know enough" for all the candidates. A clear and substantial divide separates the candidates. Long time presidential contenders Clinton, Gore, Kerry, Edwards, Giuliani and McCain are not very likely to draw a "don't know enough" response. In fact, less than 20% (and in the cases of Clinton, Gore and Kerry well under 10%) of the public actually says they haven't heard enough to have an opinion. Among this group of candidates, most of the failure to rate a candidate is due to choosing the "undecided" option. While one might think of that as lack of knowledge, this result suggests that genuine ambivalence about candidates is part of the story as well. For these most prominent candidates, ambivalence outweighs lack of knowledge. For the less well known candidates, the reverse is dramatically clear. The candidates in the lower left corner of the top figure are all much more likely to suffer from voter ignorance than ambivalence. Upwards of 70% say they don't know enough about most of these, with only about 10% expressing ambivalence. Richardson and Biden are a little more likely to be known but also more likely to draw an "undecided" response. 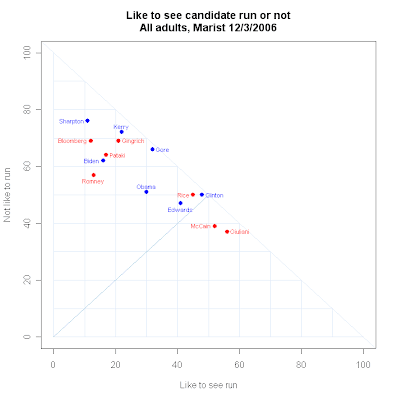 This plot also shows that Barack Obama remains more in the company of these less visible candidates than in the company of the best known six. His "don't know enough" rate remains near 50% with only modest indecision. It will be interesting to see what trajectory each of these candidates take over the next months as they become better known. Obama has enjoyed the first burst of coverage that emergent candidates can ride to national prominence. But he clearly has a long way to go to catch up with the top tier of candidates. So far I've focused on the perceptions of the national sample of adults as a whole. What about within their party, which is the crucial issue for nomination, of course. The CBS poll provides a very helpful breakdown of reaction by party, allowing us to look at how partisanship affects these favorable or unfavorable impressions of candidates. For nominations questions, we can focus on the candidate's party. But an extra bonus is that the party breakdown also allows us to look at how polarizing each candidate is. In the figure below a red dot represents Republican respondents, blue for Democrats and purple for independents. The black dot is for the population as a whole. In several of the plots the total and the independent points overlap, showing only the black for the total population. As above, the horizontal axis is favorable and the vertical axis is unfavorable. The most striking, if not surprising, result is that Hillary Clinton is indeed the most polarizing figure in the field. Her favorable-unfavorable ratio among Democrats is 72-11, while among Republicans it is 9-78. Independents split a bit to the positive side, 41-33. The population split is 43-38. It is a stable of analysis of Clinton that she must win despite the near monolithic opposition among Republicans and win a narrow majority by combining equally monolithic Democratic support with a small margin among independents. So far that story is well supported by the evidence. It is also worth noting that 15% of Democrats they they are undecided about her, as do 23% of independents. That ambivalence seems to remain her vulnerability. Previous Democratic nominees Gore and Kerry are almost equally disliked among Republicans, but nether enjoys close to the support Clinton has among Democrats. John Edwards falls short of Clinton's support among Dems, but he also draws less negativity from Republicans and does slightly better among independents. Barack Obama appeals to independents nearly as well as he does to Democrats, a potential substantial advantage, while Republicans are only a slightly net negative about him. However, the high inability to rate Obama makes this comparison a limited one. As he emerges it will be interesting to see if he can continue to win independents so well and how much Republican's learn to dislike him. No other Democrat is well known enough to make analysis of these data profitable. All need a substantial gain in visibility before distinctions such as these will be meaningful. This includes 2004 candidate Dennis Kucinich who is rated about the same as Chris Dodd. On the Republican side, McCain remains the strongest candidate in gaining favorable ratings from outside the Republican camp. But he also fall short of Giuliani in favorable-unfavorable ratio WITHIN the Republican party. McCain gains a 48-10 favorable-unfavorable rating among Republicans, but Giuliani's is 63-9. Both draw about equally among independents and McCain does better among Democrats. These data illustrate the dilemma many analysts have pointed out: Giuliani is leading most of the polls taken among Republicans. But analysts wonder how many Republicans know about his positions on many social issues that differ from those of the core of Republican partisans. These analysts dismiss the polling, saying that as voters learn more, Republicans will turn away from Giuliani. This leads them to conclude Giuliani is unlikely to be able to win the nomination. At the same time, McCain has not yet become the favorite candidate among Republicans, and especially among the conservative base which has spent years castigating McCain for not being conservative enough. The fragility of both of these candidacies is apparent in these data. As I said at the start, the danger of these polls is that they reinforce the status quo without a sense of how things can change. It is entirely likely that some candidate not currently in the top tier will emerge as a substantial challenger before the nomination is won. We just don't know who from these data. We can get a taste of very early dynamics by looking at change in favorability over time. The CBS poll provided earlier ratings for eight candidates. Most of these are from summer or early fall of 2006, but some are much older. Each panel of the figure below gives the base date from which change is measured. The arrow points from the earlier to the current poll. On the Democratic side, Clinton gained about 10 points on the favorable side, while adding only a couple of unfavorable points since September. This was enough to push her from a net rating that was slightly negative to one that was net slightly positive. Edwards was a near-mirror image of this. He gained little favorability, but reduced his unfavorable rating by 10 points, giving him a significantly improved net rating, from slightly net positive to significantly more positive. Only McCain and Giuliani are available for the Republican trends. McCain gained over 10 points of favorable ratings, at the cost of about 5 more points of negative rating. This improved his position a bit. 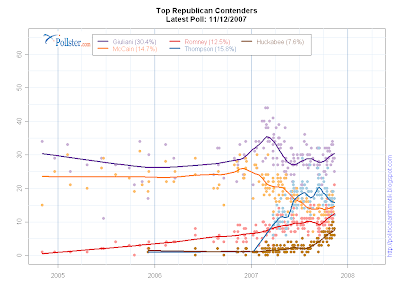 The Giuliani comparison is quite negative, but that is surely due to the over two year old base from 2004. His movement in other polls has been substantially positive. See the analysis of Marist Poll trends for Giuliani (and others) here. As the winter and spring develop, I'll revisit these data, adding dynamics that I hope will tell the story of who emerges, who fades and how the 2008 nomination battle shapes up. The first poll of the new year, by CBS News, taken 1/1-3/07 finds approval of President Bush at 30%, with 63% disapproval. This is the lowest approval reading in any CBS News poll for this administration. The result also pulls the trend estimate down to 33.5, also a low for the administration. However, it is important to discount the trend estimate until more data are available. This is the first new poll in over two weeks and the very low CBS result standing by itself at the end of the time series is exerting an unusually strong influence on the trend estimate. Until more data for 2007 come in the trend estimate should be viewed with some skepticism. 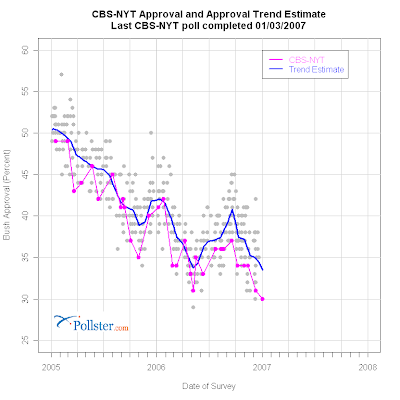 Prior to the addition of the CBS result, the trend estimate stood at 34.4%, an estimate supported by a substantial number of polls taken through 12/21/06. A reasonable guess is that the current standing is between 33.5 and 34.4, which is still near the low point for the administration, but not necessarily the very lowest well supported estimate. The CBS News poll is also one that has recently been tracking well below the trend estimate. The figure below (which we also post and continuously update at Pollster.com's poll comparison pages for Presidential approval) shows how the CBS News/New York Times poll has compared to the trend estimate in the second term. At about 4 points below trend, the CBS News poll is short of being a statistical outlier, especially once the typical CBS "house effect" of -2.06 is considered. This means that CBS/NYT polls are on average about 2 points lower in approval than the mean across all polls. Thus there is not clear evidence that the CBS poll should be discounted entirely, but the best bet would still be that approval is closer to 34% than it is to 30%. American Research Group (ARG) has reported polls of Republican and Democratic support in four early primary/caucus states. The polls are of 600 respondents for each party (with partisans plus independents who say they will participate in the party primary or caucus.) The field periods were IA 12/19-23, NH 12/26-27, NV 12/19-23 and SC 12/21-23. The strikingly obvious result is that none of the candidates outside the top four have any traction at this point. While there is time yet to "emerge", Brownback, Gilmore, Hagel, Huckabee, Hunter, Pataki and Thompson have a long way to go. So meanwhile attention remains focused on two "front runners" and two "maybes". Giuliani and McCain each lead in two states. Giuliani leads in Iowa (28-26) and Nevada (31-25) while McCain leads in New Hampshire (29-25) and South Carolina (35-28). And let's not forget the margin of error, which allows all of these to be essentially "even". The "maybes" are Gingrich and Romney, in that order. 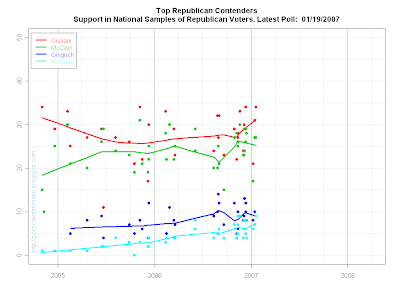 While Gingrich trails the top two by a substantial margin, he has significant support (14%-22%) in all four states. While the former Speaker has considerable baggage, he would be a more mainstream Republican nominee than either McCain or Giuliani-- a fact often overlooked in the enthusiasm for McCain at least. Romney is far back, above the "zeros" but well short of even Gingrich's status. But Romney has the advantage of being a new face who may yet mobilize support among those Republicans who distrust McCain and may come to weigh Giuliani's more liberal social issue positions. Still, Romney has to improve considerably in at least two of these early states to become seriously competitive. Here too are a number of hopefuls who are currently at or very near zero support. Biden, Clark, Dodd, Gravel and Richardson are all under 5% everywhere. Kucinich is slightly stronger, hitting 5% in Iowa, but below that in the other states. Vilsack does pretty well in his home state of Iowa, but has yet to gain any support elsewhere. And Kerry does poorly for a past winner in Iowa and New Hampshire. Clinton continues to lead the field in each state, so the question remains who will become her primary challenger. In these data, John Edwards and Barack Obama each finish second in two states. Edwards leads Obama in Iowa (20-10) and South Carolina (31-10). Obama leads in New Hampshire (21-18) and Nevada (12-8). In presidential primaries with a clear front runner, the key dynamic is driven by the emergence of a clear alternative to the front runner. On the Democratic side that battle for emergence as an alternative to Clinton is clearly underway. On the Republican side, we have a legitimate battle for the front spot, but with two candidates who both have substantial vulnerabilities within the party. There we may have a more interesting contest. Polls are looking at support for and opposition to potential 2008 presidential candidates with a pair of interesting questions. Gallup uses "Now, I am going to read a list of people who may run for president in 2008. For each, please say whether you, personally, would or would not like to see this person run for president in the next election." Marist College uses "Do you want to see (candidate) run for president in 2008 or not." These questions are asked of ALL adults, not just partisans of either party. This makes the results a bit unclear-- if a Democrat says she would like to see "x" run, when "x" is a Republican, does that mean she would consider voting for "x" or that she thinks "x" would be easy for a Democrat to beat? Thus these questions are not measures of support in party primaries, and may not be good indicators of general election strength. On the other hand, perhaps most voters are not as strategic as political professionals, and so may just be indicating how much they "like" potential candidates of either party. In any case, let's take a look at recent results. The figure above shows possible candidates of either party, red for Republicans and Blue for Democrats, in the Gallup poll taken in late November. 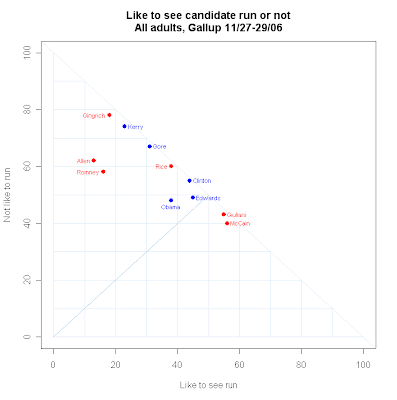 The plot is the percent saying they would like to see run on the horizontal axis and the percent saying they would NOT like to see the candidate run on the vertical axis. 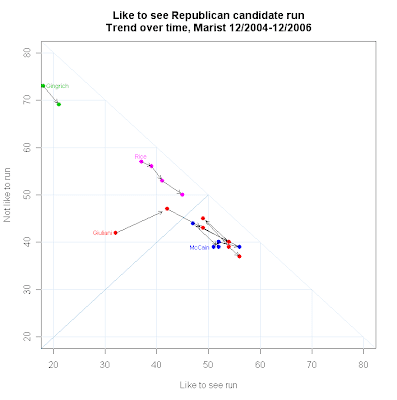 This kind of plot allows us to see immediately the balance of support and opposition to each candidate, and the extent to which voters have formed opinions about each candidate. That is a lot of information in a single plot. The plot is also unusual because the sum of the two percentages cannot be over 100%, so the downward sloping diagonal line marks the limit of possible responses. No candidate can be in the upper right (empty) triangle of the plot. 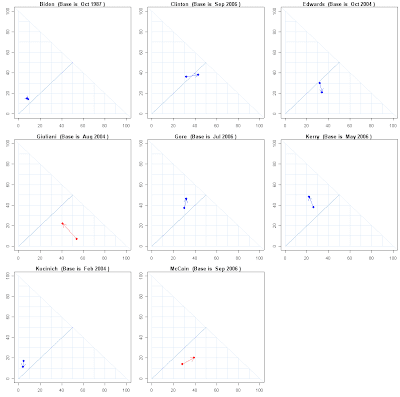 The closer to the diagonal line from (0,100) to (100,0) a candidate gets, the fewer voters are undecided about them. Conversely, the more voters who lack an opinion about the candidate, the further from the diagonal, regardless of the balance of support and opposition among those with an opinion. Finally, there is a line from (0,0) to (50,50). Candidates above this line and to the upper left corner have more opposition than support. Candidates below this line and to the lower right corner have more support than opposition. The first and most impressive result is that no Democrat is in the advantaged lower right part of the figure, while Republicans McCain and Giuliani both are. 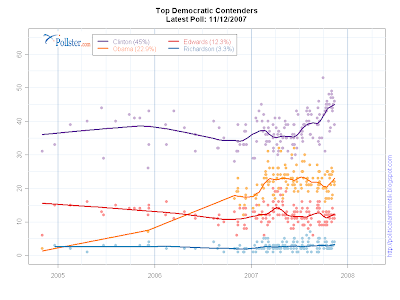 Of the Democrats, John Edwards comes closest, with Clinton and Obama a bit behind. (This poll was taken over a month before Edwards' announcement of candidacy in New Orleans last week, so this is not a reflection of his recent actions.) While Clinton is very close to the limiting diagonal, showing few people lack opinions about her, Edwards is a bit further away and Obama a bit more, neither of which is surprising. But given the publicity Clinton and Obama in particular have recently enjoyed, it is surprising that neither has more support for a run than opposition. Given Edwards' relatively low profile in the fall, it is more surprising that he has the most support for a run of the three. McCain and Giuliani lead the Republican field by a wide margin, with both more support than opposition and relatively few voters lacking opinions about them. While Giuliani has lead McCain in most polls of Republican primary voters (30 of 39 polls as of late December) among the adult population McCain has a slight advantage on this question. While trial heats are another measure of advantage, with potentially different results, this plot shows that Democrats have yet to field a candidate with the balance of support of either of the two Republican poll leaders. Among Republicans, Secretary of State Condoleezza Rice came in third, though her repeated statements of non-candidacy make this a highly speculative rating in any case. Former House Speaker Newt Gingrich trails the entire field of candidates in either party. Defeated Virginia Senator George Allen not surprisingly shows both little support and considerable lack of recognition. But Massachusetts Governor Mitt Romney is in nearly the same position. While no one expects Allen to make a run at this point, Romney clearly has considerable ground to make up. To his advantage, he can possibly convert lack of recognition into support, something better known candidates cannot do. The Marist Poll data closely resembles the Gallup results. 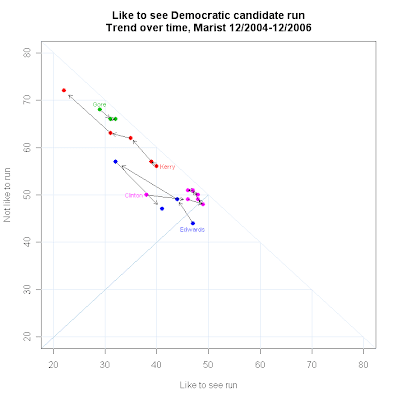 The figure below shows Marist results from 12/3/06, and adds data for Biden and Sharpton for the Dems and for Pataki and Bloomberg for the Reps.
Marist has asked its question a number of times, so we can trace the dynamics of support for some candidates using their data collected at various times since December of 2004. Since Marist and Gallup closely agree in their latest polls, I assume these paths are not unique to the Marist poll. In these plots the arrows point from earlier to later polls, though the polls are not necessarily all equally separated in time. First the Democrats. The clear story here is the stability of Clinton's support, some variability in Edwards, though ending rather strongly, and the steady collapse of support for Kerry. In addition, Al Gore has remained well back and rather stable. 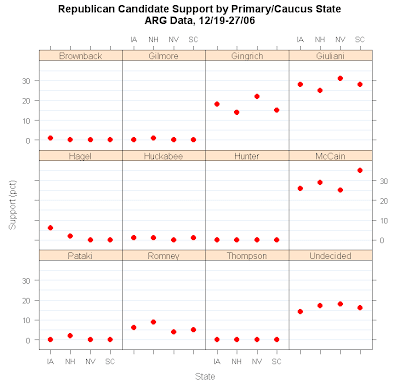 On the Republican side McCain follows the Clinton pattern of quite stable support. Giuliani on the other hand shows considerable growth in support over the last two years, from well back to parity with McCain. Rice is interesting simply because of the growth of support despite the decline in approval of President Bush and of many administration policies with with Rice might be identified. 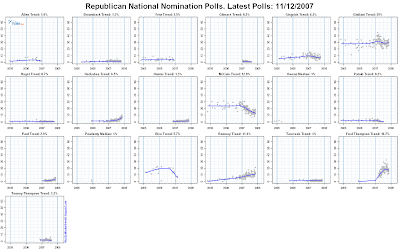 Gingrich has only been measured twice, and shows little movement. The dynamics may be quite different within party constituencies, so these results may not reflect changes in the nomination battles within the parties. But they do show that the Democratic candidates have some ground to make up, and that there is room for some dynamic change in both parties, as exemplified by Kerry'[s collapse and Giuliani's surge.